Regardless of whether you operate in the tundra, the sub-tropics or in a temperate climate, extreme weather will occur. If your storage facilities can’t handle this weather, then your property will be damaged, and people’s safety will be put at risk. Steel warehouses, which are composed completely of steel and include solid foundations, are some of the strongest buildings on the planet. For the cost of materials and labour, a steel storage facility will cost you pennies on the dollar for construction. This is because of prefabricated buildings, which require so little work to erect at your chosen location that you don’t even need the help of a professional to get the job done. Between roofing, siding, the interior, flooring and other independent elements that make up a typical clay, concrete, metal and plastic parts, steel warehouses are just composed of a few sheets of solid steel, so they don’t have this same maintenance problems as other buildings. How quickly do you need to expand your organization’s storage facilities? Between permitting, contractor scheduling, material acquisition and delays, typical building construction can take well over a year. If you have an urgent need for an expansion or upgrade of your storage facilities, this simply won’t do. A steel warehouse, on the other hand, can be erected and fully functional in mere days. Just because the primary function of storage facilities is for storage doesn’t mean that a warehouse has to be a garish eyesore on your property. Many storage facility manufacturers don’t realize this fact. Thanks to steel warehouses, this doesn’t mean that you have to settle. All steel buildings include a sleek, futuristic design that blends seamlessly into any style. If you only needed to store your company’s property for a short time, then you’d pay a third-party storage company an exorbitant fee instead of investing in a new addition for your own storage facilities. The building that you invest in should be able to last a long time; steel warehouses are often guaranteed by the manufacturers for a quarter of a century, so durability is never a question. Fire is a risk, no matter what types of materials you are holding in your storage facilities. Standard building materials used for storage facilities (wood, drywall, etc.) are very flammable. Steel warehouses minimize the problems that fires can cause by not contributing to them. With a melting point of 2750 degrees F, steel buildings are outstanding fire deterrents. Are you using the right type of building for your storage facilities? Thanks to the capabilities of steel warehouses, storing your organization’s property in a safe, reliable, long-term, cost-effective manner doesn’t have to be a difficult thing to figure out. 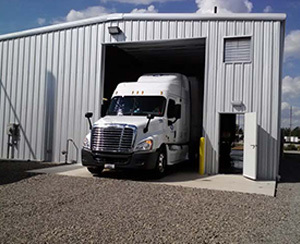 When you invest in your next steel warehouse, make sure that you are using the best, so that you can guarantee that you get all of the benefits associated with steel buildings.